Telltale's love and deep understanding of Minecraft combined with a thrilling satisfying climax keep Minecraft: Story Mode Episode 4 - A Block and a Hard Place from reaching a new series low at the hands of poor dialogue and a meandering plot. It's still a little too slow-paced and predictable to recommend wholeheartedly. Despite some emotional beats not hitting as hard as they should, Episode 4 of Minecraft Story Mode feels like a satisfying ending (even though there's more to come). Overall, Episode 4 is a strong outing for Minecraft: Story Mode. By the end of the two hours, I was ready to begin the final chapter. And yet, as good as this next-to-last episode is, including an emotional goodbye to one of the best characters, the bulk of the cast still don't leave much of an impression, which has been my main complaint in past reviews. This episode could very well be considered the finale for the first season. It wraps up the Wither Storm saga, it answers the questions about the Order of the Stone, and it delivers a semi-happy, hopeful ending for the crew. If only it did that without an utterly boring first half and the clumsy insertion of mandatory Telltale story elements, it might have also been a good ending. Though I'm critical of some repeating gameplay tropes in the series, this episode does also do quite well to feature a few more puzzles. Navigating a large maze does lean toward the tedious – and doesn't exactly make too much sense in the world of Minecraft, where you can break down walls and build bridges in moments – but the puzzles through which you piece together some of the key moments from the Order of the Stone's past are enjoyable, and it's nice to see elements of crafting involved as well. However, on the whole, these puzzles are still rather simplistic, aiming to be easily accessible for children. The conclusion to the Wither Storm storyline is delivered in a refreshing and heartfelt way, and I am looking forward to seeing what Jesse and friends get up to in the conclusion. Minecraft: Story Mode Episode 4 continues the momentum from the previous episode in true Telltale fashion. Many of the series flaws remain, but many more have been fixed. The accelerated pace of the narrative really helps here as well, with the story of the Wither Storm coming to a close in both fun and surprisingly dramatic ways. As of episode four, Minecraft: Story Mode feels like it's on the right track to conclude in a more interesting way than it originally appeared, but I'm not sure yet whether that makes dragging yourself through the first three episodes worth it to see the better places the series goes as it nears its conclusion. The fourth and penultimate episode of Telltale's first season of Minecraft: Story Mode has yet again failed to impress. A satisfying conclusion to this story arc, full of revelations, heartbreak and humour. The only things that really hamper Story Mode's penultimate episode are some predictable moments and how little much of its cast have developed over the span of the past four episodes. 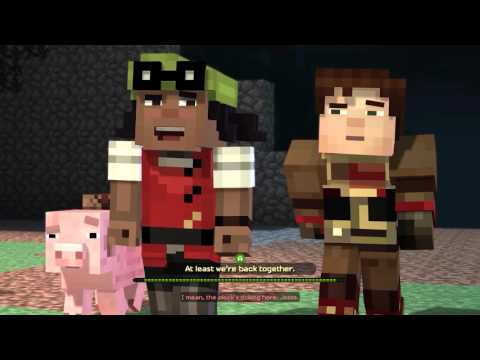 Like the series overall, Episode 4 of Minecraft Story Mode is a tale of two games. On one hand, you have a charming adventure that should delight younger audiences. On the other hand, it may not have enough of the serious meat that older gamers would like to see in their point and click adventure. As for what the finality of A Block and A Hard Place entails for the next episode, we'll all just have to wait and see what Telltale has in store for it. The fourth episode leaves players with the satisfaction of one part of the adventure over (for now), though the the fifth chapter we'll have to see what's left in the blueprints for the series to be building towards. Minecraft: Story Mode's penultimate chapter does a great job of both concluding the main plot and delivering more of Telltale's trademark character moments and emotional beats. Episode 4 makes Story Mode as a whole easy to recommend, and it will leave you itching to find out what the writers have planned for the final chapter. Minecraft: Story Mode – Episode 4: A Block and a Hard Place is the strongest episode yet in basically every aspect. Family-friendly but not childish, in-depth but not self-obsessed, Minecraft: Story Mode's actual story is consistently stellar, if not spectacular, over all four episodes.